– The overall crime rate in 2017 is projected to decrease slightly, by 1.8 percent. If this estimate holds, 2017 will have the second-lowest crime rate since 1990. – The violent crime rate is projected to decrease slightly, by 0.6 percent, essentially remaining stable. This result is driven primarily by stabilization in Chicago, and declines in Washington, D.C., two large cities that experienced increases in violence in recent years. 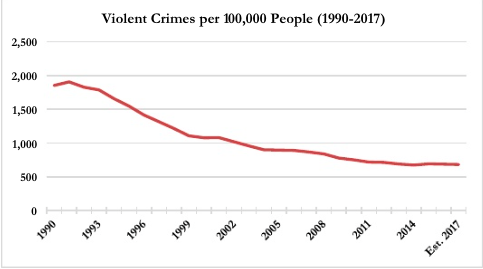 The violent crime rate for this year is projected to be about 1 percent above 2014’s violent crime rate, the lowest recorded since 1990. – The 2017 murder rate is projected to be 2.5 percent lower than last year. This year’s decline is driven primarily by decreases in Detroit (down 25.6 percent), Houston (down 20.5 percent), and New York (down 19.1 percent). Chicago’s murder rate is also projected to fall, by 2.4 percent. The 2017 murder rate is expected to be on par with that of 2009, well at the bottom of the historic post-1990 decline, yet still higher than the lowest recorded rate in 2013. – While crime is down this year, some cities are projected to experience localized increases. For example, Charlotte’s murder rate doubled in the first six months of 2017 relative to last year. In writing about this report, Philip Bump suggests that it leads the Trump administration to a vexing problem: “Is it too soon to take credit?” We all know that’s what is coming. So far the president has already taken credit for job creation, stock market increases and decreases in border apprehensions that showed trends long before he was elected. It is undoubtable that he will continue that pattern on this one. Those who want to believe Trump will, of course, do so when he claims that his law and order stance has proven successful. Pretty good con job, wouldn’t you say: lie about a problem that doesn’t exist and then claim to have solved it? But many of us know that our friend Kevin Drum nailed it a while ago when he wrote about the link between lead in our environment and violent crime rates. So this is the choice before us: We can either attack crime at its root by getting rid of the remaining lead in our environment, or we can continue our current policy of waiting 20 years and then locking up all the lead-poisoned kids who have turned into criminals. There’s always an excuse not to spend more money on a policy as tedious-sounding as lead abatement—budgets are tight, and research on a problem as complex as crime will never be definitive—but the association between lead and crime has, in recent years, become pretty overwhelming. If you gave me the choice, right now, of spending $20 billion less on prisons and cops and spending $20 billion more on getting rid of lead, I’d take the deal in a heartbeat. Not only would solving our lead problem do more than any prison to reduce our crime problem, it would produce smarter, better-adjusted kids in the bargain. There’s nothing partisan about this, nothing that should appeal more to one group than another. It’s just common sense. Cleaning up the rest of the lead that remains in our environment could turn out to be the cheapest, most effective crime prevention tool we have. And we could start doing it tomorrow. There was one candidate in the 2016 presidential election who promised to do something that could have actually accelerated the downward trajectory in crime. It certainly wasn’t Donald Trump.